For most athletes, it takes years of training to become successful and renowned. Michelle Atherley is not like most athletes. The words inked on her arm, “My ambition is my weaponry,” provide a glimpse of her dedication. Only four years into her track and field career, Atherley is no stranger to accomplishments. At Auburn, she was the only freshman to qualify for the 2016 NCAA Indoor Track and Field Championships. 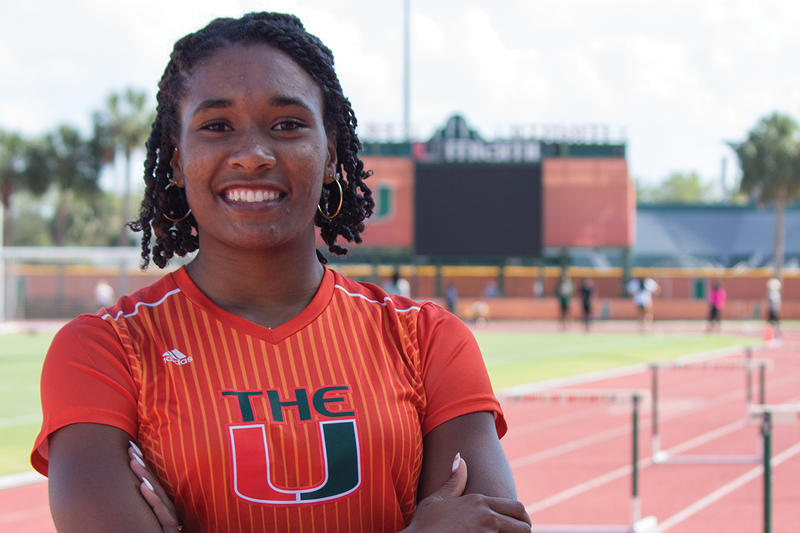 As a sophomore at the University of Miami, she has been named an ACC champion. Atherley is also no stranger to struggle. Her mother passed away when she was just a baby, and her father passed away early in her life. She was adopted by her stepmother into a family of six other children. This optimism is what keeps her grounded and grateful when her stepmother texts her, “You can do it, I’m so proud of you,” despite her lack of knowledge about track and field. Atherley laughs and changes her pitch, trying to imitate her stepmother. As a child, she used to play soccer with two of her brothers, who still live in their family home in North Point, Florida. She continued to do gymnastics until she reached high school and tried every sport possible until track and field became a life-consuming hobby. She also used to say she wanted to be a lawyer when she grew up – and the feeling has not gone away. Atherley studies political science at UM with the hopes of interning with non-profit organizations. When she was younger, she had no idea what the future had in store for her. Today, Atherley’s schedule consists of weights at 6 a.m. until class at 11 a.m., practice until 5 p.m., studying to 8 or 9 p.m. and returning to her apartment with her dog, Rocky, to read Eric Thomas’ The Secret to Success before going to bed. As a student-athlete, she lives such a planned life that it becomes difficult to do anything else off the track. Her tunnel vision once caught the eye of her former track and field coach, Dereck Walker, during her senior year. Walker recalls how Atherley would drive two and a half hours to practice and would stay the weekend at his house to train for the summer. “By the time the year came, I had every college calling my house,” Atherley said. Even with the attention she has received throughout her short track and field career, her roommate and teammate, Ebony Morrison, recognizes that she does not let her accomplishments get to her head. Although Walker dreams of seeing Atherley in the Olympics, Atherley sees her life as constant progression, no matter which direction it goes. Whether it is law or sports, nothing will ever stop Michelle Atherley.